First Line: On this cool, damp Sunday afternoon in spring, with clouds and rain showers sweeping in from the Atlantic a hundred miles to the west, Bruno Courrèges had his day off. When one of the tourists doesn't show for a luxurious cooking vacation outside the small French village of St. Denis, the hostess is quick to call Bruno for help. The tourist is nowhere to be found, her husband is unreachable, and just when Bruno learns that she may have been traveling with her lover, both she and her lover are found dead. Her lover was an Irishman with a background in intelligence as well as ties to the woman's husband. It's a case that raises more and more questions the more Bruno investigates. He also has a more personal "case"-- the young star of the local girls' rugby team that Bruno coaches is pregnant, which puts her chances of being named to the French national squad at risk. This, too, has Bruno asking questions, questions of himself and his beliefs. At the beginning of this eleventh Bruno Chief of Police mystery, readers learn that Bruno has been given added responsibilities, and some of the more interesting parts of the book have him dealing with these as well as members of the police force that we've never met before. I liked seeing him out of his comfort zone. Not everything ran smoothly, and he often had to think quickly to avoid disaster. The past few books in the series have had Bruno involved in cases in which the French government works with other countries-- especially when the investigation has to do with terrorism. A Taste for Vengeance does involve terrorism (from a source which surprised me... and should not have), and Bruno gets to work closely with counterparts in the American and British governments. I do like seeing that governments can actually work together for the common good. We need more of that. It was refreshing not to have a mystery that linked to World War II, and in many other respects, this book shows us the Bruno that I've known and loved since the very first book. I only have one small quibble, which will make some people shake their heads: if anything, there is too much food throughout the book. Yes, I love the cooking-- the tastes, the smells, the history of the food and drink, watching it being prepared, the camaraderie. But there were too many such scenes that kept taking me away from the investigations. Removing one or two would've sharpened the pace and the suspense yet still had me hopping in the car to go to the local French grocery store. But as I've already said, A Taste for Vengeance shows me the Bruno and the St. Denis that I love-- and that I'll always come back to. 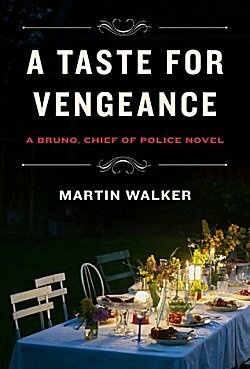 If you love mysteries that are recipes filled with well-seasoned intrigue, characters, and a setting so pitch-perfect you'll start speaking with a French accent, you simply have to read Martin Walker's Bruno Chief of Police mysteries. Ils sont magnifiques! I do love this series but am not very far in as yet, I have the next book to read on my library pile. Just love the French setting. I'm so glad you liked this, Cathy. This is such a fine series, I think, and I do like the Bruno character. I do like Bruno, too.